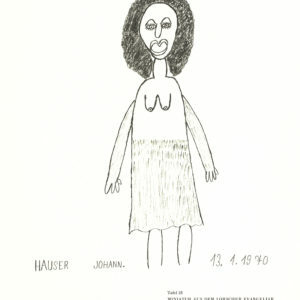 Johann Hauser was born in 1926 in Bratislava, Slovakia. From 1981 until his death in 1996, he lived and worked in the House of Artists in Gugging. His illustrations of beautiful and ugly women, rockets and tanks, snakes and palaces, are both powerful and intense. In 1990, he and the Gugging Artists were awarded the Oskar Kokoschka Prize. His can be found in the Setagaya Museum, Japan, the Collection de l’Art Brut, Switzerland, as well as in many other public and private collections, such as the Helmut Zambo Collection, Germany.